And it opens this awful modal dialog. Uh… well, no thanks, I would rather not have everything I read automatically and publicly logged on Facebook. The dialog closes. And that’s it. No article opens. Then I realize something. Facebook is actively breaking the fundamentals of the Web. The “link” I clicked in my news feed would seem to be a textbook example of a hyperlink: Blue, underlined words describing a page on another website that I should be able to click and read. Or right-click and open in a new window, or maybe long-tap on a phone and copy the URL of… but no. No, that “URL” isn’t foreign; it’s a link to a Facebook.com page requiring me to grant unacceptable permissions to an “app” before, you know, reading the other side of the original pseudo-link. It’s shameful. Broken. Even evil. Facebook ought to be ashamed. Yahoo ought to be ashamed, too. And they should know that I never ended up reading the article I saw in my timeline. Just as well. Yahoo is a bad web citizen; yahoo.com news stories from as little as two years ago (and maybe less!) now result in 404 file-not-found links. Those items are gone. It means swaths of blogs and sites have broken links, that sources and references are now unverifiable. It’s not just the news: Perhaps both more and less understandably, Yahoo removed whole neighborhoods of content when they took GeoCities completely offline, too. The Web isn’t supposed to be taken so cavalierly. 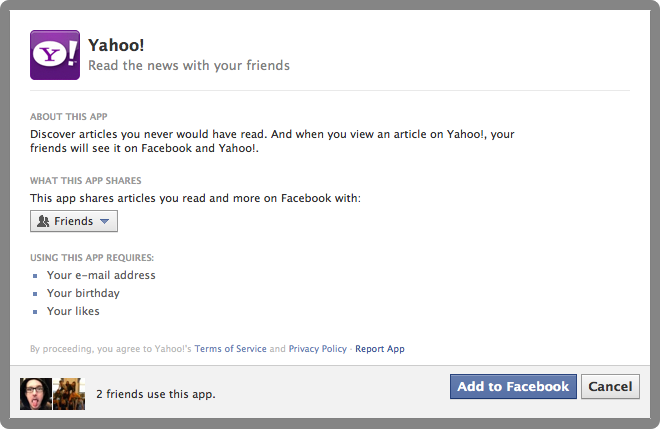 End result: I will be finding less content via Facebook, and reading less on Yahoo. It’s just as well.